Amazon's site worked only sometimes Monday afternoon, as the company's big sales event began. Amazon’s website experienced widespread crashes and problems Monday shortly after the e-commerce company’s annual day of sales, Prime Day, began at noon. The company’s fourth Prime Day is set to stretch for 36 hours and includes deals across its site, as well as at its Whole Foods grocery-store chain. Amazon acknowledged the issues about two hours after they started Monday, saying in a statement that it was working to fix the situation. “Many are shopping successfully – in the first hour of Prime Day in the U.S., customers have ordered more items compared to the first hour last year,” the company tweeted. Amazon hasn’t disclosed the specifics of its sales haul for previous Prime days, but the day has historically been a success at least in getting people to sign up for Amazon’s $119-a-year Prime subscription service. The company said last July that the 2017 Prime Day marked the single biggest day for Prime sign-ups up to that point. Amazon’s Prime membership program offers two-day free shipping, access to some TV shows on its streaming service, discounts at Whole Foods and a host of other perks. Its members also spend more on the site than nonmembers. 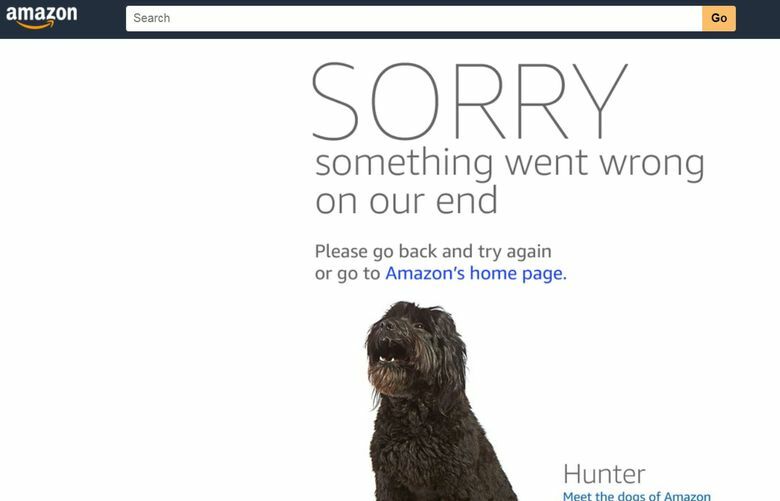 The error messages and problems searching for deals on Amazon’s website hit a peak in the minutes after Prime Day started Monday, according to downdetector.com, which tracks outages across the internet. More than 24,000 people reported problems early in the noon hour. The number of reports had dropped to about 800 by 3 p.m. as issues seemed to improve. The tracker’s outage map showed the problems were centered mostly in the U.S., especially in the Pacific Northwest, Northeast and California. Twitter users both reveled in sharing pictures of the dogs Monday and despaired at missing out on deals. Note: The dogs do not appear to be for sale.